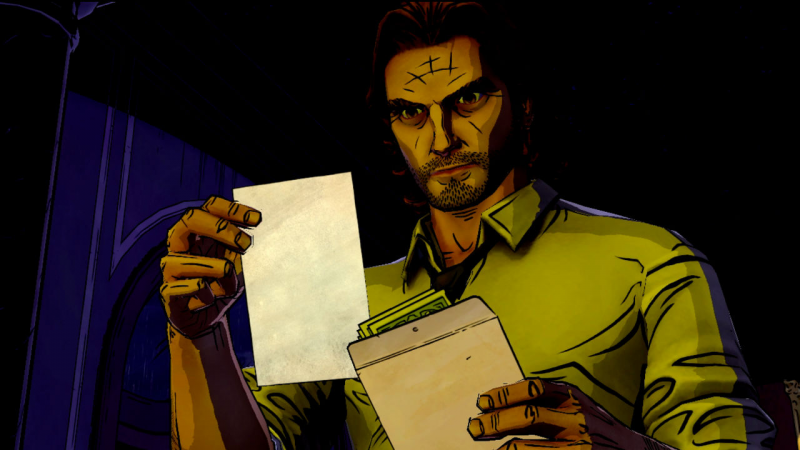 When we last saw Bigby Wolf, he had just discovered a damning piece of evidence. Could Ichabod Crane really be the murderer? This is what we hope to find out in episode three of The Wolf Among Us, entitled "The Crooked Mile", which picks up at the exact point that episode two ended. From the very first second of this episode, emotions are high. Bigby is insanely furious, and sets off to find Snow White, and hopefully Crane. Sure enough, things turn sour pretty fast, as some previous characters turn up and cause a lot of trouble. It's an intense, emotional opening to Telltale's next chapter of the story of the Fables. "The Crooked Mile" plays out like a detective story, moreso than the previous episodes. You're basically looking for clues in different locations, to further piece together this twisted jigsaw puzzle of a case. This worked pretty well in LA Noire, but in The Wolf Among Us it just feels like you're moving the cursor over, pressing a button, listening and repeating. Sure, the information that you get from the evidence is interesting, and the script is well-written as always, so it's far from boring. It's just a little repetitive and doesn't feel like you're doing as much as you have previously. The first episode had some memorable action sequences, but nothing in the two episodes since has come close to matching them. At one point in the story, there are three locations to visit, and you choose which you go to first. This section is done really well, as whichever one you go to first, you'll find the information that you need. An event happens at whichever you visit second which renders that version of the evidence redundant, meaning you'll always get the same information. On one hand, it's cleverly done, meaning you'll never miss anything, but on the other hand, it's just an illusion of choice. In the long run, it doesn't matter which order you check out the locations in, so it does feel like an unnecessary plot mechanic. On the search for Crane, you'll meet many characters both old and new, including one of the best yet: Bloody Mary. She's incredibly cold-hearted, brutal and sadistic, and works for the mysterious Crooked Man. There is an awesome encounter with her and some cronies at the end of the game, which sees Bigby pushed further than ever before. The action is fast and visceral, and it's a beautiful crescendo with which to end the episode. The usual problems reappear, to no great surprise. The jumpy frame-rate that seems to have been minimised in The Walking Dead is still causing problems in Fabletown. There are also some points in the story where Bigby needs to find Snow to keep her safe, but then will happily go to the next location alone, leaving her unsupervised. It just seems like he's asking for trouble. Snow seems rather content to be left alone too, even though a potential murderer is obsessed with her, and is probably going to look for her soon. 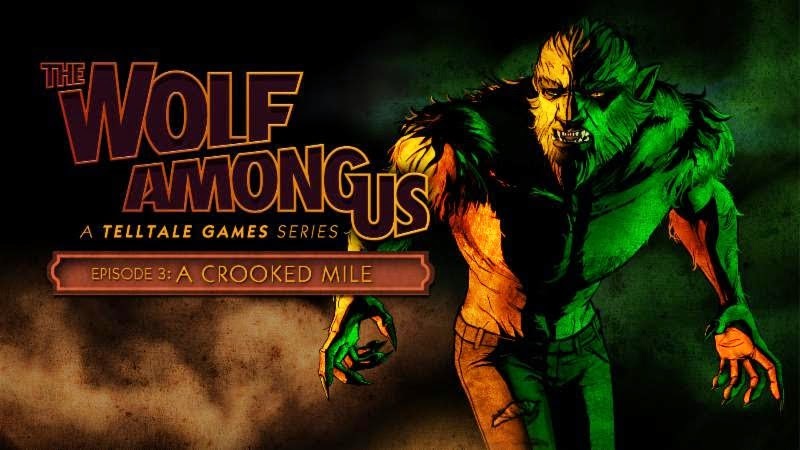 "The Crooked Mile" marks the halfway point of this season of The Wolf Among Us, and whilst it's not quite as gripping as the first couple of episodes, it's by no means a poor effort from Telltale Games. The quality of the writing is as high as ever, and the twists and turns in the story manage to keep it fresh and interesting. Like episode two, there is less action than in the debut, but the story progresses relatively well, and the set up for episode four is fantastic. Players of the previous episodes probably don't need much convincing, but this is absolutely worth a download. The Wolf Among Us - The Crooked Mile is available now for Xbox Live Arcade, Playstation Network, PC, Mac and iOS.